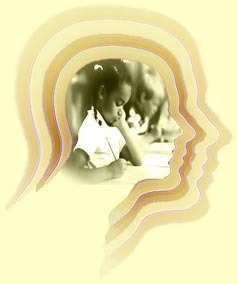 School psychologists work to find the best solution for each student andsituation; they usedifferent strategies to address student needs and toimprove school and district-wide support systems. Collaborate with teachers, parents, and administrators to find effective solutions to learning and behaviour problems. Help others understand child development and how it affects learning and behaviour. Provide psychological counselling to help resolve interpersonal or family problems that interfere with school performance. Use evidence-based research to develop and/or recommend effective interventions. Early Intervention Colorado- Information for early childhood development and resources in Colorado. English Language Learners (ELL) too. Children and Adults with Attention Deficit/Hyperactivity Disorder- Information in Spanish and English about ADHD including support groups. Colorado Kids with Brain Injuries- A resource network relating to traumatic brain injury for parents, educators, and professionals. Contains links to Colorado Brain Injury Alliance & Colorado Department of Education (CDE). Available in Spanish. National Institute of Mental Health- This website has information and online publications for several mental health issues including: anxiety disorders like Obsessive-Compulsive Disorder (OCD) and Post Traumatic Stress Disorder (PTSD); Attention Deficit Hyperactivity Disorder (ADHD), Autism Spectrum Disorders including a parent's handbook, Bipolar Disorder, Eating Disorders, Depression, etc. Colorado School Safety Resource- This site provides information and resources related to bullying, responding to bullying and empowering children to build positive relationships. Second Wind Fund- This site provides information and some warning signs related to suicide and teen depression.